It was ten years ago when I was first introduced to a style of yoga known as Yin Yoga. Then, as now, a buffet of yoga experiences were available, and I studied and taught many of them. Out of all of them, though, Yin Yoga is the style of practice that made the most lasting impact on my body, mind, and spirit. It is the style of yoga that most closely matches the traditional purpose and definition of yoga—to still the body and quiet the mind. And, it is the style of yoga—and by extension, the approach to life—that I believe our world needs most right now. To begin, allow me to expand upon the meanings of yin and yang, and how each operates in our bodies and in our world. They may be invisible, but they are impactful forces of energy. Yang energy is hot, quick, light, and bright. It is ambitious and driven. It is associated with daytime, the sun, and the element of fire. Yang energy burns. It is a lighting bolt of force to be reckoned with. Whether it offers life-giving heat, or destroys with an unappeasable appetite, depends on how we tend to it. Yin energy is soft, slow, reflective, receptive, and compassionate. Its nature is gentleness and simplicity. Yin nurtures, allows, holds, and receives. Yin energy is associated with the elements of earth and water. Yin rules over nighttime and the moon. Yin cools. It too is a force to be reckoned with, but for entirely different, mysterious reasons. The forces of yin and yang are interdependent and complementary halves of a whole person or functional society. To revere one as more important or worthy is to disturb the equanimity and balance of our home, country, or universe. As our human bodies are each a microcosm of the universe, imbalance can occur in our own lives if we focus only on the development of one half of our nature at the expense of the other. Yang without yin is immature expression—scattered, fearful, jealous, and anxious. 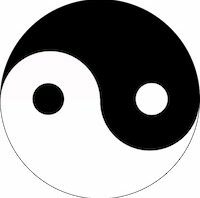 At its worst, without the wisdom of yin supporting it, yang is ruthlessly ambitious and destructive like a bull that has seen red. It can act as greedy as a wildfire—without reason or pacification or a care for others’ needs. Yin’s increasing absence in our world is what allows this destructive force to move without boundaries. This is why, as a teacher, I promoted and taught Yin Yoga more heavily than the many hot-n-harder classes. This unbalanced yang energy, sometimes referred to as the “toxic masculine,” is what we see in the world today. It has infiltrated our governments, our corporations, our police forces, and our streets. It is an energy that casts aside and marginalizes the feminine, neglects the soul, and scoffs at authentic and vulnerable expression. Sometimes, it even scoffs at basic human kindness and decency (see: Donald Trump’s tweets). Yin energy without yang can also be dangerous. Without the light of yang, we can’t find our way in life. Depression is a perfect example of yin without yang, as it is missing the fire necessary to clarify and cleanse our thoughts and bodies. At its worst, yin without yang is withdrawn, bitter, spiteful, and passive-aggressive. Here too, the soul cannot come forth. Creativity is stifled when there is no light to usher it in or bathe it beneath. For human beings living and working together in society, it is important that both energies receive equal respect and nurturing. When ones energy stifles the other, restoration is necessary. One way that we can each contribute to bringing more yin into our world is by simply bringing more into our bodies and minds. And an easy way to do that is to try Yin Yoga. Yin Yoga is characterized by long-held, quiet, and passive postures. In this way, it contrasts with hot yoga or vinyasa yoga that focus on heat, movement, and activity. A good example of a Yin Yoga pose is Butterfly pose. Sit on the floor, knees bent, soles of the feet against each other. Then fold forward from the waist until you feel resistance. Finally, allow your head to hang, your palms to turn upwards, your hips to slowly open. Stay still and silent for four minutes, maybe five. Breathe. Let go. Surrender to gravity. In Yin Yoga practice, we come up to but do not go beyond our edge. That means we reach the point of discomfort, but do not push to the point of pain. And then we stay—still, silent, reflective. We feel—tension, agitation, frustration. We notice—mosquitoes in the room, children playing outside, our foot falling asleep. We notice and do not push away any experience. A room full of people practicing Yin Yoga may look like a still photograph. Outside of the slightest movement of a body breathing, it may look like nothing’s happening. But in the womb of yin, our minds are relaxing. Our hardness towards life is softening. Our fear is shifting into courage. While ambition is fueled from yang energy, true courage springs only from yin (think of Aslan, the lion, in The Lion, The Witch and the Wardrobe). Slowly, we become less afraid of discomfort, and more willing to enter its embrace to ask what it intends to teach us. Discomfort, we notice, often fades in its own time—the mosquitoes fly away, the children run away, our foot wakes up. Having trained up a willingness to be with ourselves just as we are, we grow our self-acceptance and self-respect. In so doing, we cultivate a more gentle approach to the world. We become more likely to respond mindfully, rather than react impulsively. But we don’t even need to have an official practice of Yin Yoga to increase yin’s energy and influence in our lives. Anytime we honor the qualities of yin in ourselves or in others, we increase the level of yin in our universe and decrease the harmful effects of too much yang. This also means that we don’t allow practices of compassion or empathy to be tagged as weaknesses. Nor do we allow kindness or gentleness to be labeled negatively. For it is only in the sacred, quiet space of yin that we can rediscover who we are—magical, soulful, mindful, heart-centered creatures. It is only in yin that we can turn inward and remember why we are here—to love, to serve, to connect. And it is only in the silence and stillness of yin that we can remember that we are not each other’s enemy, but each other’s friends, teachers, and guides. The call back to our yin leads back to the path of our soul. Because the call to our yin is coming from our hearts, and our hearts always know the way. This entry was posted in current events, healing, health, Spirituality, wellness, yoga. Bookmark the permalink. ← In the Era of Trump: Should I Stay or Should I Go?